NEW in 2016...Bronze components! A little heavier than the pewter, but so richly dramatic! 2-5/8 inches long including surgical earwire, 1-3/8 inch across. Open center with curves and eyes extending out like a peacock motif. Cast in pewter and antique silver plated, lead and nickel free, weigh 3/4 ounce for the pair. 2-3/8 inches long including surgical earwire, 1 inch across. Graceful chandelier drop shape with open centers and granular texture details. Cast in pewter and antique silver plated, lead and nickel free, weigh less than 1/2 ounce for the pair. 2-3/8 inches long including surgical earwire, 1-1/8 inch across. 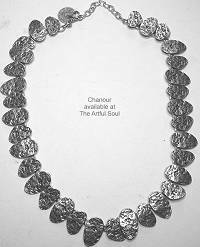 The disks have a roundish rustic design with darker recesses, cast in pewter and antique silver plated. Lead and nickel free, weigh less than 1/3 ounce for the pair. 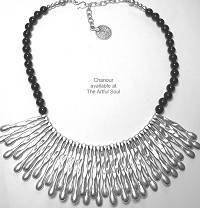 13 inches of disks, smaller layered on top of the larger, are linked across front of necklace, with back chain and hook clasp to finish at 16-19 inches long. Larger disks are 1 inch across, smaller are 1/2 inch. Each element is cast in pewter, antique silver plated for satin sheen, lead and nickel free materials. Made in Turkey, weighs about 3.1 oz. 3-3/8 inches long including surgical earwire, 1-1/4 inch across. Half-dome and bar at top hold the trio of petal-shaped elements with textural interest. Cast in pewter and antique silver plated, lead and nickel free, weigh about 1/2 ounce for the pair. 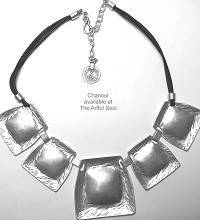 10 inches of hammered convex disks are joined to strands of black leather, with back chain and hook clasp to finish at 17-18 inches long. Triangles and circles, 2 inches tall at the center. Each element is cast in pewter, antique silver plated for satin sheen, lead and nickel free materials. Made in Turkey, weighs about 2.4 oz. 2-1/8 inches long including surgical earwire, 1-1/2 inch across. The larger triangles have dimpled/hammer surface, cast in pewter and antique silver plated. Lead and nickel free, weigh 1/2 ounce for the pair. 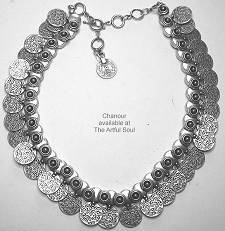 14 inches of substantial pieces, floral-embossed disks under beaded links, span gracefully in a gentle curve around the neck, 1 inch wide. 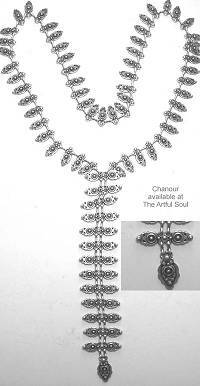 Back chain and toggle clasp to finish at 16-19 inches long. Each element is cast in pewter, antique silver plated for satin sheen, lead and nickel free materials. Made in Turkey, weighs about 5.4 oz. 7 inches of square-ish disks are joined to strands of black leather, with back chain and hook clasp to finish at 18-20 inches long. Each square has a hash-mark textured border that folds up slightly on the edges from a polished convex shape center. Largest at center measures 2 inches tall, smaller on sides are 1-1/2 inches tall. 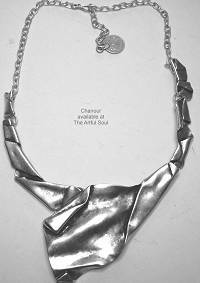 Each element is cast in pewter, antique silver plated for satin sheen, lead and nickel free materials. Made in Turkey, weighs about 2.4 oz. 1-7/8 inches long including surgical earwire, 1-1/8 inch across. Convex circle at center, has rough branches circling around it. Cast in pewter and antique silver plated, lead and nickel free, weigh less than 1/4 ounce for the pair. 7/8 x 1/2 inch flat disks are shaped like nuggets with distressed impressions, joined in the back to curve graceful around the neck, 17 inches across. 18-20 inches long with adjustable back chain and hook clasp. Each element is cast in pewter, antique silver plated for satin sheen, lead and nickel free materials. Made in Turkey, weighs about 2.4 oz. 2-1/8 inches long including surgical earwire, 3/4 inch across. 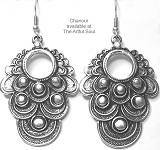 Small flower and larger coin elements with dangling beads, cast in pewter and antique silver plated. Lead and nickel free. 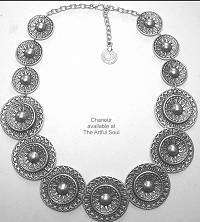 Ornate sunburst motif on round disks join nearly the full length of necklace. 19-21 inches long with adjustable back chain and hook clasp. Larger disk is 1-1/2 inches across, smaller one is 1 inch, smaller layered on top of larger toward the center. 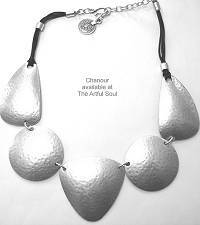 Each element is cast in pewter, antique silver plated for satin sheen, lead and nickel free materials. Made in Turkey, weighs about 4.2 oz. 3-1/4 inches long including surgical earwire, 5/8 inch across. Convex circles with bead centers dangle like chimes from links under a u-shaped square wire support. Cast in pewter and antique silver plated, lead and nickel free, weigh about 0.3 ounce for the pair. 1-7/8 inches long including surgical earwire, 7/8 inch across. The irregular rectangle shapes are really just one piece. Cast in pewter and antique silver plated, lead and nickel free, weigh less than 1/2 ounce for the pair. Several metal pieces appear to be folded into an intriguing art piece spanning 9 inches of the front, 2-1/2 inches tall at the center. 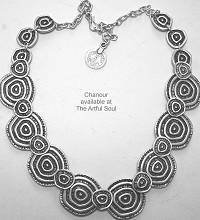 They are linked for curving around the neck, and will have an asymmetrical finished look. Back chain and hook closure for 15-20 inch finished length. Each element is cast in pewter, antique silver plated for satin sheen, lead and nickel free materials. Made in Turkey, weighs about 2.3 oz.